Growing Southern | Garden Blog: Mexican Yams + Expatriate Chemist = "The Pill"
Mexican Yams + Expatriate Chemist = "The Pill"
You might be surprised to know that the 60's sexual revolution was sparked by a vegetable! The human hormone that makes up the active ingredient in" the pill" was first synthesized in bulk by modifying a plant hormone found in the Mexican Yam. But getting back to the Mexican Yam story- Why use plant hormones to make a human hormone ? Well plant hormones are similar to human hormones. We can't harvest people, and chemically hormones can be very difficult to create from scratch. Before this synthesis method was developed, doctors were already realizing the potential of this hormone, progesterone, to treat medical conditions like menstrual disorders. However, it was extremely expensive. In the 1930's, progesterone sold for $80 a gram. 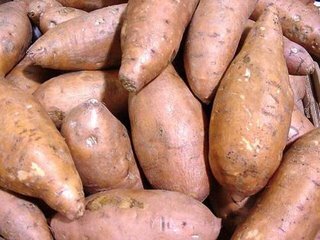 An American Chemist, Russell Marker, found that diosgenin, a plant hormone extracted from yams, could be cheaply converted into a human hormone, progesterone. Despite the obvious potential of this type of research, not a single American pharmaceutical company wanted to take on the project. However, this did not deter Marker. He quit his prestigious academic job, emptied his savings account, and moved across the border to spend his days drinking tequilaulia and learning everything he could about harvesting yams. Thanks to the work of Marker and succeeding workers at Syntex, a small biotech company in Mexico, progesterone became cheap and readily available, which lead to the eventual realization that it could be marketed as an oral contraceptive. Today, forty years after the introduction of oral contraceptives, "the pill" is one the most common methods of birth control. Although there are even better ways to synthesize it now, about half of oral contraceptives on the market still contain this same active ingredient that was first synthesized in bulk using Mexican Yams. Visit the science section of the American History Museum in Washington D.C.
It’s funny, because two hours ago I was peeling a large bowl of store-bought yams for my wife’s favorite casserole. My name is Tim, and my wife is Sara. We have a gardening blog and do our gardening on one of the Southern Gulf Islands off the coast of British Columbia, Canada. BTW, congratulations on Carolina winning the Stanley Cup! Even though we were rooting for the Edmonton Oilers (national pride and all) we recognize that the Hurricane played really well and never hesitate to point out that three players on your team are from Canada, including the captain. That means that the Stanley Cup will at least spend a little time in this country this summer! I do the vegetable gardening, while Sara is responsible for the beautiful flowers that are opening up all over the place, as we speak. I grow yams, too, but they won’t be ready until the fall. You’re probably harvesting yours right now, since your weather down there is so much warmer. The wild yams that were first used in the birth control research were of the Dioscorea species, which are genuine yams. They are tropical plants, the same as the sweet potato. The word yam comes from the African word “nyami,” which refers to the starchy edible root of the Dioscorea genus of plants, according to the horticultural specialists at North Carolina State University. Dioscorea batatas is one species of yam that can tolerate colder temperatures. It originates in the mountains of northern Japan, so it can tolerate temperatures as low as -20° Celsius. Which is why we can grow it in Canada. You get a better yield if you leave the plants in the ground for two years. Their roots grow down vertically, so they can be spaced close together, perhaps 20 to 30cm. They seem to be free of disease, although we still use Scorpion Juice to inoculate them against pathogens with acquired systemic resistance (SAR), as we do with all our plants. The yam tuber, which is the part we eat, has been used medicinally in Asia. It is believed to stimulate the stomach and spleen, and to be beneficial to the lungs and kidneys. Among other ailments, it has been used in the treatment of asthma and dry coughs. My wife’s casserole recipe is one of our favorites. She bakes layers of sliced yams with layers of peeled and sliced golden delicious apples, sprinkled with parmesan cheese and liberally covered with melted butter. Season to taste. She also roasts the yams by themselves sometimes, just like roast potatoes. One thing I learned as a gardener, is that all plants need the proper nourishment to thrive. They not only require the basic macro nutrients (Nitrogen, Phosphorus, and Potassium-N-P-K) but an expert ratio of these three, plus a whole array of micronutrients in minute amounts. Luckily, I have the experts at Advanced Nutrients, who supply me with the most appropriate organic plant foods for all my gardening needs. Billed as a microbial rhizosphere colonizer, Voodoo Juice is the exotic name of the liquid solution containing five strains of microbes, designed to colonize the roots of our plants and enable them to absorb nutrients more efficiently. It creates greater root mass and its use results in healthier, more vibrant plants. Visit our website and see the pictures. We still have some of that yam casserole left for tomorrow night. With a big salad, it makes a complete meal. I am growing tenty yams with my twenty first graders here in Brooklyn New York- any idea how long till they begin the emergence stage?